Given the poor reviews this film has received, I can only assume the distributors are hoping to pick up spill-over business from Star Trek. A crash landing leaves a teenager and his legendary father stranded on Earth, 1,000 years after cataclysmic events forced humanity's escape. With dad critically injured, the son must embark on a perilous journey to signal for help, facing uncharted terrain, evolved animal species that now rule the planet, and an unstoppable alien creature that escaped during the crash. Father and son must learn to work together and trust one another if they want any chance of returning home. 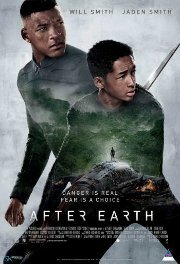 Comments This science fiction film tells the story of a young teen boy and his loving but absent and strict father whom together are forced to overcome past sorrows and fears in order to survive the unexpected mission they find themselves on. This film contains complex and mature themes of a mild impact which could be confusing and upsetting for young children under 10 years of age. There are also mild to mderate impact scenes of fantastical violence with brief scenes of blood and death. Such violence may distress young children who are unable to discern between fantasy and reality. Children between the ages of 10 and 12 require parental supervision.